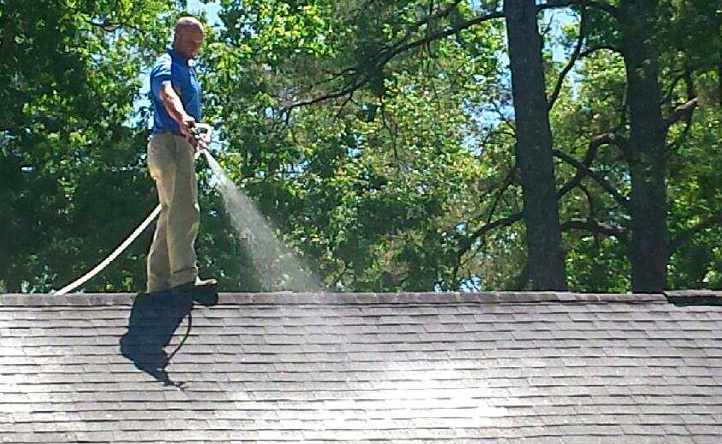 Before you hire someone to come out and clean your roof in the Greenville NC area, there are some very important things you should be aware of. Because if the contractor cleaning your roof doesn’t follow the proper roof cleaning methods and procedures, you could end up with a much bigger problem than a dirty looking roof. Your Roof Isn’t Dirty! It’s true. Those unsightly stains and streaks on your roof shingles are actually an infestation of algae, mold, and bacteria growth that feeds on moisture and the limestone filler material in your roof shingles. Standard pressure washing may remove the “stains” for a few months, but without a proper Soft Wash treatment to attack and kill the infestation at its source, they will return in almost no time, thicker and darker than ever before! Never Let Anyone Pressure Wash Your Roof! Too many homeowners have found out the hard way that standard pressure washing and roof shingles are not a good mix. Standard pressure washing does remove the stains (for a brief period), but it also blasts away shingle granules and forces high pressure water into your roof decking. This harmful combination not only shortens the lifespan of your roof shingles, it can also lead to more mold problems – exactly the opposite of why you wanted your roof cleaned in the first place! Soft Washing Is The Right Way To Clean Your Roof! Our safe “Soft Wash” roof cleaning method begins with a gentle application of specialized cleaning agents that have been designed to break down, kill, and lift the algae, mold and bacteria growth from the surface of your roof. These cleaning agents are 100% biodegradable and are safe for your family and pets. Once that has been achieved, all that is needed is a gentle rinse (think “garden hose” pressure) to wash away the organic contaminants. What you will be left with is a fresh, clean, “like new” roof that will stay looking great for years – not just months! Want to know more or schedule a Soft Wash Roof Cleaning estimate? Give us a call in the Greenville, NC area at (252) 258-5975. Or CLICK HERE to contact us online.